Koya is a folk dance from Orissa, India. No festive occasion, whether religious or social, goes without song and dance in Koya tribal comminuty. In this festive dance the Koya girls forming a semicircle dance with simple yet graceful movements. Like all tribes, the Koyas also love dancing and singing. No festive occasion, whether religious or social, goes without song and dance. In the festive dance the Koya girls forming a semicircle dance with simple yet graceful movements. Each holds in her right hand an iron rod with jingles, which is rhythmically tapped on the ground while dancing. The dancers wear brass band of about three inches wide on their head as headgear. They dance putting their right hand on the left shoulder of the nearest dancer. The percussion music is provided by a group of drummers playing slightly conical drums. The drummers are all male and they wear headgears with two bison horns and several strings of cowries that dangle over the face like half-mast. 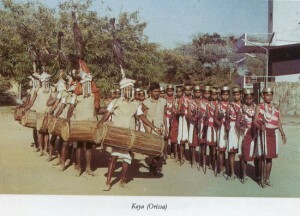 The drummers look exactly like those of Bisonhorn Marias of Madhya Pradesh, with whom the Koyas have cultural similarities. Both the dancers and the drummers sing while dancing.